service to the community at a fair price for honest work. when we're done, you'll never know the stump was there. of our customers have to say about us. No job is too big or too small for us to handle. In a few hours, what was once a lawn impediment is ready to become part of the yard. Cliffside Stumpgrinding can remove the stumps, material, and even plant new grass. You’ll never know the stump was even there. Get rid of tree stumps easily! 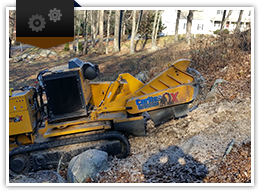 Cliffside Stumpgrinding is the stump grinder with the equipment to meet all of your stump grinding needs. We can do it all from the 108 inch across Norway Maple to a row of ornamental hedges in the flower bed. Use our quick and easy online quote form to get a Free Estimate for your stump removal. You can also take a look at our services page to quickly calculate the cost yourself by measuring the diameter of your stump(s). We have the best prices and customer service in the state! With our experience and level of professionalism there is a good reason why we are the best at what we do in the New London County, Hartford County, Windham County and Tolland County Connecticut areas. Taking great pride and care in our work is a priority and seeing to it that your lawn and yard is left the same way as when we arrived is the best we can deliver to you. Cliffside Stumpgrinding participates within the law regarding Call Before You Dig (CBYD). We ensure that it is safe to perform our services on your property.